The rear wheel drive Nissans are absolute classics in their own right, and a gold-mine for anyone wanting to build a fast, reliable, good-handling car, either for road, track or drifting. 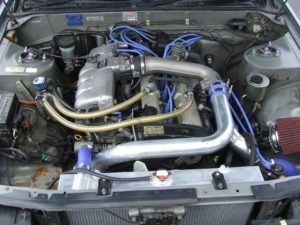 There are the six cylinder cars- Skyline, Laurel and Cefiro, and the four cylinder cars – Sylvia, 200SX, 180 SX, all available with and without turbo. The sixes (the RB’s) come on 2 litre 2.5 litre, 2.6 litre (the Godzilla) and 3 litre (Aussie Nissans and Holdens) It is possible to build a RB30DET by taking an aussie 3 litre block and fitting an RB25DET head. It is common to fir bigger turbos, and some phenomenal power outputs can be achieved. The fours (SR’s) are no slouches either- conversions of a DE to a DET by fitting a turbo are common, as is fitting bigger turbos. The suspensions on all of these cars is basically sound from the get-go, and respond well to fitment of adjustable platform struts (coil-overs), adjustable camber arms, caster bars, etc. The braking systems can generally be interchanged- the bigger brakes come with 5 stud hubs. Front Intercoolers are commonly fitted, and often holes cut in the inner guards for Intercooler ducts. Yes that mod would need to be Certed, and I can’t see much of a problem with it. I have a mazda b6t FWD 323 wagon 1989 model, i’m planning to take this 100kw turbo engine out of this wagon and place it in a non-turbo mazda 323 sedan 4WD 1995 model which currently has a 79kw b6 engine. No modification to the mounts or engine bay is required (same engine block and head, just a turbo bolted on basically and a lower compression ratio) (4wd gearbox bolts straight up to). I was wanting to know if anything needed upgrading in the way of brakes or anything else before i get a cert for it. The rest of the the 1995 mazda sedan is straight stock standard. Also how much does a cert cost? And is there a cost to re-do it if you fail the first time? Sounds like a pretty straightforward Certification. The LVV Requirements for brakes is to perform 3 stops from 100 kph, I think that your standard brakes would cope, although if you could get a set of the bigger brakes now would be a good time to fit them. At John Brett Technology (Low Volume Vehicle Certification) we aske that you present the car in a WOF condition- and recommend that you get a WOF check done first to be sure. That way you are likely to get a pass on the first LVV Inspection. We don’t charge extra if a recheck is needed, but obviously don’t want to be doing repeated re-checks for WOF items. Phone us on 0800 LOWVOLUME to discuss prices, and appointments available. I have a 94 s1 R33 skyline…..Was a GTS25.. but have bolted on a turbo and supporting fuel mods & management…..dyno shows 201.5 HP ATW currently but only because of missfire at 10 pounds of boost….Factory states 180Hp for the N/A. Do you think the brakes will be sufficient for cert? I really dont want to mess around getting new rims and tyres to suit a 5 stud conversion. I thought that a GTS25 had a turbo from standard? Brakes on all of these Nissans are all good. The LVV Cert requires 3 stops from 100 to 0. Your car should be fine without upgrade. Thank-you for the promp reply! The GTS25 came out as a non-turbo model of the GTS25T, with 4stud hubs instead of 5, and the Weaker rb20DET varient gearbox. Hopefully everything else will be upto spec aswell. I understand That I will also need to fit a catalyctic (sp?) converter and catch can to pass?? Another slight worry i have is the chassis rails (or what i think are chassis rails) seem to have been crushed in ever so slightly on both sides in the same place, almost as though someone has hit a speed bump and bottomed out? Will this be an issue? It never has been with WOF’s…..
Hi- Thanks for putting me straight about models. We have to meet an emission standard, which means that you need the POSITIVE CRANKCASE VENTILATION SYSTEM left in place, and no catch-can. (Why do people want to put Catch cans on engines?) As you are not changing the engine, we do not need to require a Cat, or to do the on-road emission test. I’ve recently had some bucket seats fitted to my Nissan Skyline 1989 R32 GTST and wondering about the certification process for these… They have been put together using aftermarket base brackets as well as aftermarket rails however have retained the factory mounting positions and the seat belts have not been altered in any way other then changing the seat beat clip in pint from the standard seat to the after market base bracket mounting point. Is this alright? The problem area is in the strength of the seatbelt mounting- the load on the buckle is 15 Kilonewtons (about 1 1/2 tonnes force). The standard rails are tested to this load, but with aftermarket rails there is no certainty that they are strong enough. Any welding also comes into question. If in any doubt, you should bracket the seatbelt buckle directly to the floor mount, using 40 x 3 flat steel strip. Great post, you seem to know your stuff. I did find a few points that I was unsure about, but thanks to Google I now understand your points fully. Hi Sam- I have done emission tests of 12A rotaries, and been able to pass them. I have never done one with Oil premix, so I don’t know how it will work out. The best advice I can give is to get it tuned properly, so there is minimal unburnt hydrocarbons coming out of the exhaust. A good tuning shop with an exhaust gas analyser would be able to help. (c) a current and valid competition logbook has been issued for the vehicle by a national motor-sporting regulatory body recognized by the Low Volume Vehicle Technical Association (Inc). You are exactly right! Well done for doing the research first. What sort of vehicle is it? what engine is it? was wondering if it was required to get a cert if i have swapped a rb25det with its 0riganal rb20det into an r32gtst??? Note also that Driveshaft safety loops will be required, also a Catalytic Converter will be required if the engine has been fitted since 1 May 2010.
i have a hilux with a 5MGE supra engine on the standard bolts and mounts how much would this cost to cert? Hi Angus- Approx cost about $500.00 depending on what other mods there are. Best idea to phone us, on 0800 LOWVOLUME (0800 569865) if you in or near Auckland. Hey there i have a 1993 r32 nissan skyline that came out as a standard Rb20DE, it was made into a rb20de+T but was heavily modifyed and got about 300hp out of it, of course the non turbo engine couldnt handle this and it blew up, so iv had a genuine rb20DET put in, i was woundering if you could please tell me what i will need to do in order to pass cert?? Hi- this is a pretty common conversion- with no big Certification problems. Was it Certified with the converted motor? If it was, then there is no need for a new Cert, as you have just done a “Repair” by changing the engine same for same. If it was NOT Certed, then to get Certed you will need – two driveshaft loops, and a Catalytic Converter. Brakes are usually OK whether standard or changed, any suspension or wheel changes have be Certed, any seat changes. Phone us on 0800 LOWVOLUME (0800 569865). hi, i have a holden vl rb30e and have just put a turbo on and was wondring what tests are done to get cert. I know about the braking, heat sheld, wastegate has to be plumbed into exhaust but is there an emissions test? and do i need drive shaft loops? ( i havent done any thing to the drive train) do i need a fan cover and is there any clearances between intercooler piping and pullies? I got a cerfio a31 just wondering if it is ok to cut another intercooler hole into where the battery goes (battery in boot now) as i have changed to a front facing intake plenum problem is the intercooler piping that was in before the piping went just above the siderails and the hole has no way of connecting to the intake yet i dont want to affect frontal damage what could be some options? I have been restoring a 1973 Mitsubishi Galant Colt GTO. I have an SR20DET lined up ready do go into it and wondered if I should be looking at getting a pair of ‘Modern Brakes’ for the car aswell. As I am told that this is a good idea to get the engine/brakes all certed at the same time, due to the cost of certing it. If so what kind of brakes would you recommend? And have you done something like this before? any tips? e.g. With repowering old classics with modern engines? That an oldie! Why not use a Mitsi motor like a 4G63, it will be all Mitsubishi that way. The turbo motor will make that car a real handful, I would stick with a non-turbo motor just for safety. The LVV Test is 3 or 5 stops from 100 k to 0, the standard brakes may just pass, but it would be far better to look for better ones. I don’t know what fits, but start with a Mitsi wrecker, and look for bigger discs and calipers from some later Mitsi, say an Eterna or Sigma. The best plan is to ask ask ask, there could be some stetup you can bolt on. If you need to adapt the calipers, its OK to get brackets made up, try to avoid welding, get them machined from a solid block. I would suggest sticking with the standard rear brakes, it’s the fronts that do all the work, also you don’t want to end up with too much braking at the rear because you will get rear wheels locking, which is dangerous. I have heard you can’t cert body swaps any more. Is this true? I am looking at putting a Hilux Cab onto a Nissan safari Chassis (1991 ish). Whats the story? My other option is to put the Nissan axles coils etc under the hilux chassis, but this seems like a lot more work. Any recommendations much appreciated. Thanks. We have been getting some strange rulings from the LVVTA lately. It will probaly be classed as a “Scratch Built” Vehicle, so you would need a Certifier with that category. Best you talk to a scratch-built Certifier first. Dear Sir, I have a Rover SD1 2600 with a very tired motor which will need a complete overhaul. What would be required according to the regulators to fit a Toyota 5M-E motor and auto gearbox? Hi John i spoke to you the other day thanks for the great info i forgot where you had mentioned to place the safety loops for the drive shaft and also i see on your other comments that a brake upgrade it not neccesary as the standard 4 stud skyline brake setups are ok but im planning on upgrading the turbo and putting a big front mount intercooler and upgrading the computer would i then require a brake upgrade to the 5 stud setup? and also will i be needing a catalytic converter for the exhaust system? i also intend on changing the seats to some aftermarket seats what are the requirements for the mounting? is there also a requirement for certing for bodykits? See reply below, re access to rear seat. Dear Sir, Thankyour for your reply regarding the repowering of a Rover SD1 2600, your advice is noted. In answer to your query regarding the Toyota motor type, yes it is a 5M-E motor, SOHC,crossflow design from a 1981 “Cressida” rated at 145hp,8.8:1 comp. ratio,with a 4 speed auto. The project is planned to be completed by December 2011. Hi there, I’m looking at replacement diesel engine for my Nissan Terrano 93 D21 TD27T2 73kW. This is mechanical inj and all newer models are EFI, so I would need an ECU to run the pump ? Can I use a QD3.2 110kW intercooled turbo from R50 or even R51 YD25 or do i need to stick with newer version of TD engine? Hi would I need to cert ke30 if I swop the 3k with a 5k ? I cannot figure out what a 5K engine is. If you are fitting a different TYPE of engine you will need a LVV Cert. This includes changing to Turbo version. What exactly is the difference between a 3K and a 5K? – how much can i cut out of the crash bar? – and can i make my own crash bar to fit around intercooler? – do i need a catylitic converter as ive changed th engine to rb30det? -ive also got a catch can (as ive changed inlet manifold) that vents to atmo is that certable? 1 You can’t cut anything out of the crash bar. If your car is a frontal impact model you can’t modify the frontal impact structure in any way. This is because we don’t do crash-testing on customers cars. 2 If you change the engine, you need a cat, unless the car wasn’t built with one, or if the engine was not fitted with one. Crankcase ventilation to atmosphere is not allowed, has to have the PCV Valve back into the manifold. thanks for answering all these questions, accessible info like this is great. so. car is 4×100 pcd. currently it has a gutless 1.6l motor. I’d like to change It to a holden. 308 as its an easy swap. aside from bigger brakes and everything else- should I be upgrading to 5 stud front hubs or is that not a requirement? Thanks for the compliments Nathan. I have lost the thread, not sure what car you are talking about. 1 There is no fixed requirement to upgrade brakes, the test is does the vehicle pass the LVV Brake test. Not knowing what car I don’t know how it would go. 2 A Holden 308 is a big heavy engine for a 1.6 litre car- and not especially powerful. The weight and size could be problems. Is there not a Jap turbo motor that will fit? What’s the go with battery being in the boot of the car in a vr4 1988 ? I’ve been told no cert needed is this true ? hey john some good info you have up there mate just a few questions im doing a swap on a 1985 nissan r31 skyline passage its the japenese version. im putting a rb25det in it i have one with 300kw would you be able to tell me what i need for a cert?it came out with a rb20e automatic it was converted to manual and certed but the old owner never picked up the cert plate i think i still have the paper though. i gather i need drive shaft hoops and im going to put bigger brakes up the front but it is drum brake in the rear so i dont want to have to change all brakes will just better fronts be ok? hi cheers for the quick reply john. ok i will upgrade the fronts only will put bigger brakes from a newer skyline i also need somewhere for my intercooler piping to go my batery bracket has been removed due to batery going in boot but is it ok to cut a round hole in where it was ? i see someone else has asked this to but didnt quite get the answer something to do with a crash test or something i have seen holes cut before but is it just better to try and find another way for the piping to run? I am going to buy a 3L 5 speed vl gts and it has a rb25det in it.I was just wondering whether I needed a cert for it? Yes you would need a Cert. Hi John, great site you are running here! I have a R32 GTR, which came from Japan with a few modifications. One is that it is fitted with the front brakes off a R34 GTR (324mm disc, Brembo 4 pot vs standard 296mm disc, Sumitomo 4 pot) with the matching master cylinder. The brakes fit unmodified. The same Brembo brake setup also came on the R32 GTR V-Spec (obviously mine is a non V-Spec). Does this require a cert? From what i was told it came through compliance like this, only requiring a cert for the adjustable suspension. Thanks John! I may as well add a few more mods to the list then and get it all certed together, shall be in touch when shes done! Thanks for your help. Hi Jordan- for a two piece driveshaft, two driveshaft hoops. New seats on factory rails are fine. Seatbelt buckle is not affected, so no problem there. Hi John, i have got a 1990 skyline R32 Coupe factory N/A RB20 De, i have done some extensive work to it so far and i would like to convert it to a RB20 Det,i have been tidying it up etc, it has had 15 previous owners and i have taken my time restoring it as i would like to keep it, so far the car has got Certs for kings lowering springs, Hicas removed, gearbox X mounts from the previous owner. I have converted it to 5 stud and the big 4 pot caliper brakes & brake lines and put LSD diff in it done by proffesionals do i need Certs for my Diff?, my DET motor is getting rebuild at the moment as i would like to have a peace of mind once i put it in, what’s bothering me at the moment is that the previous owner cut a hole(square) approx 20x20cm by where the factory airbox used to be just below the inner left guard as he ran a pod filter,far off from the side rail/wall and hasn’t modified the front iron bumper bar at all, would this be scrutinised when i take my car in for Certs?? as i would like to run my intercooler pipings through it..my gearbox and engine should be ready next week to be put in and i have been eliminating faults just from your replies to the questions on here(many thanks to you! )..but yep i dont wana muck around and take it in for Certs straight away as this is my daily driver,as i cant afford to get it PINK stickered and any other advice would be appreciated,many thanks in advance. Sure and thanks for the prompt reply, i will email you pictures when i finish my shift tonight, Cheers. Hi, I have a 1984 300zx and i want coilover suspension problem is it has seperate spring/shock semi trailing arm rear suspension, is it certfiable to replace seperate spring/shock set up to a single coilover unit in the original shock mount? as for the front is it legit to cut strut tubes and weld on coilovers? Hi Jarrod- At the rear, the shock mount is not strong enough for the spring loads. You can get adjustable spring setups for similar setups, they have an adjusable base, and spring to fit on top. Hi again John, I got in contact with you couple of months ago about my R32 Skyline coupe, I have now upgraded and installed a Rb25 det motor in it note that is was only running a Rb20de, well just and update as I saw a lot of dodgy work done by the previous owner, I have installed brand new hanger bearings for the driveshaft and now waiting for the loops to turn up and installed b4 I book you in for the Certs. Below is a list of work I have done and has been certed, if you could point out what else I need to be sorted before we set a date for cert, please bare in mind that this is my daily driver and im currently off the road as I am on work leave :). – Side mount intercooler(unseen from the front as I would like to keep it a sleeper) ps iv tidied those holes. Now I haven’t run the exhaust yet, im assuming that the CAT converter is all I need for certs, if you can point out anything else I needed to be done I would really appreciate it, Cheers. Hi Tex- it all sounds good- I can’t think of anything you have missed. I could come out to have a look if you like. i have 3 cars that need a cert do i get a cert or do i wait till everything is done then get a cert as every thing that will need to be re-certed will cost me or will it? to get a cert for big jobs like turning it into a ute do i have to see the cert guy for progress updates or do i have to sketch/write what im planing to do on paper prior to doing it? can i do the work then go for a cert? Where are you?? could you contact us directly please. The vehicle, the suspension, and the tie rod ends will all need to be certified. Normal tie rod ends will cope with any lowering of a Nissan that can be certified, so no point in spending the money on angled joints. Hi there I was jus woundering , i have a 89 r32 rb20de that the engine has now blown and have another 89 r32 but rb20det that had a previous lvv cert but rego has lapsed , if I was to do a engine swap would I have to get it cert’d again? Yes you can, provided it is fuel grade. You will need more clips to secure it. Why would you want to use a flexible line? Hi, I’ve recently bought a 1989 hr32 skyline. It had a rb20e and auto trans standard. No air bags or abs. Someone has converted it to a rb20det manual. I think I’ve got it all sussed to pass a cert except i just noticed they’ve cut the whole front bumper beam out to fit the front mount intercooler. Just want to know if that’s ok or if i should get it replaced by a pannel beater and just cut enough to fit? Do i call you on 0800 569865 ? During the week? I have also changed the front and rear lower control arms to Evo items and also the front and rear hubs to 5 x 114.3 Evo items. The brake calipers and discs are also Evo items. I presume all of the above needs to be certified? Also I want to confirm, I will need 2 x drive shaft hoops and also a cat converted installed for certification? What would the cost be to certify all the above? Hi Thomas- I have done these before- they make an awesome little car, shorter, lighter, and more agile than an Evo saloon. Yes, you need a cat IF the original car AND the new engine had a cat. ALL the mods need to go on the Cert- I expect your brakes will be no problem. Hi Thomas- This is a big revenue earner for the NZ Police. I have learnt that YES- it is considered an ENGINE MODIFICATION REQUIRING CERTIFICATION! Make sure that the waste gate is plumbed back into the exhaust, or has a compliant exhaust and silencer. Just wondering, I just brought a 95 Nissan navara which has been fitted with a td27t engine from a terrano, which bolted straight in!! Does this need to be certed?? And if so how much am I looking at?? What was the original engine? If an engine is changed to a different type, or modified it would need a Cert. Hi, I have a non turbo r32 skyline and was planning to put in a 20det motor with the factory side mount and everything. What would be needed for a Cert? Many Thanks for the reply john. I have a 1988 holden vl vacationer 2l which now has a rb25 det in it all factory stuff except the intercooler. Will this need to be certed? An roughly how much would it be? Im planning on buying a 1999 C35 Nissan Laurel that will be manual converted and repowered with an RB20DET engine. I plan to add a frontmount Intercooler which would require cutting the inner guard to fit. Because it is a frontal impact car, this would not be allowed for certification. How would i go about adding the front mount intercooler? Would i need to make a custom piping setup to fit without cutting an metal? Done a complete rebuild and transplanted a 1jzgte into toyota supra 1994. How much for a lvv certification on fuel system running under the car surge tank is up under the diff and the 044 pump is also mounted under the car, The motor itself 1jzgte single turbo is completely rebuilt by a reputable engine builder putting out a lot more power than the factory engine 2jzge ( to be confirmed at dyno ), Transmission is the original but has been made to be manually shifted auto, Brakes have been upgrade to the supra 4 pot front 2 pot rears off the 2jzgte model, wheel adaptors are on the front only to clear the bigger brakes, rear seat bottom part has been removed as installed a pair of subs and amps instead just want to make as a 2 seater car, battery relocated to the boot, and anything else you would think that needs to be done please advise as want the car to be completely legal and not have any issues with police. Many thanks Jared. Hey I have an r32 and it had a ca18 in it and now it has a rb20det in it and has a manual conversion, 5 stud conversion, adjustable suspension and front mount intercooler, does it need anything else to pass the cert? And where do I get the cert done? hi there i have a 1998 Nissan skyline R34 i have put my front mount intercooler on but i also cut a hole big enough for the piping below the batterie box i was wondering if i need a cert for this as i read on couple forums of where to do it ?? OK Kharlos- a change from non turbo to turbo needs a LVV Cert. The previous owner should have got this done. The WOF people probably missed this. The Nissan plate for the car should say ‘Engine RB20 DE” or “RB25 DE” if it was built as a non turbo, and “DET” if built as turbo. You WILL need a Cert! Looking at turboing my 2003 350z first registered in Nz 03/06. *Removal of front intrusion bar to fit the intercooler? Just wondering what will need to be done for cert and approximate price. Thanks. Removal of front intrusion bar is a definite NO. Engine Mods WILL require driveshaft loops, one for each section, within 50 mm of front universal joint. We can’t quote for the Cert, there are NO LVV Certifiers available in Auckland, sorry. I suggest you phone NZTA on 0800 108 809. Do I need a cert for aftermarket caster, tie rod, traction rod, toe arms. The brand would be “hard race” and if they do require a cert my question is why?? aren’t they factory adjustable for wheel alignments?? LVV Certifiers are required to list all modifications and make sure they meet requirements. Imagine, say, if an caster arm was fitted which was for some reason unsafe. The LVV Certifier would be expected to fail it just the same as he would if say an unsafe tyre was fitted. Will the factory wheels be added to cert plate or not?? The rules used by the LVVTA are different, and they expect you to get a new LVV Cert if you change wheels. If you fit wheels which meet the WOF requirements after the LVV Cert, I don’t think you should have any problem from the WOF people. which of these mods will need low volume cert and how much are we talking? This sound like a pretty nice conversion. Essentially, ALL modifications need to be LVV Certified. Exhaust noise- the best approach is to run the vehicle through a WOF inspection to see if they fail it. If they do fail it, then so will the LVV Certifier. I am looking to buy an r32 gts25 that has been converted to an mspec gtst. It doesn’t have a cert, I know about needing the drive shaft hoops, is there anything else I will need? It also has front mount, 3″ turbo back exhaust and bov etc. The guy will cert it for me if I want (obviously a higher price) but I’m wondering if I should just do it myself. Any advice would be appreciated. HI John i have fitted a rb20det into a a31 cefiro that had a factory rb20de and have fitted the driveshaft hoops but have been told that i will need a turbo drive shaft can you please confirm this. Hi Alex- Who told you this? Was it a Certifier? There is no rule as such, it is up to the judgement of the Certifier. I personally think that using the turbo drive-shaft is a good idea, it’s what the manufacturer thought was needed. dam. whos easy est to get it done? e.g. I have had customers fit bigger brakes still on 4 stud hubs. Further, the LVVTA is now making Certification decisions over the Certifier’s head. So, talk to your certifier a bit more, he might have good reason to fail it, or he might have been over-ruled by LVVTA. Hi mate. I have a 94 r33 skyline gts (factory rb20e) and the previous owner has fitted a rb25de. It passed a vtnz warrant check with no cert. Does that mean I don’t have to get a cert? No, unfortunately, it needs a Cert. VTNZ must have missed it. Hi Robert- I no longer do LVV Certs. There is no LVV standard or rule covering this- the LVVTA would now decide over their desks if this is OK. You should ask them. Hi John i am wanting to run 15 x 7.0 ET+24 and 15 x 7.5 ET+18 wheels on my factory gts-t which is 5 stud, will i need a cert for spacers as the wheels arent going to go over the bigger brakes without them and will it need a cert for the wheel size being smaller than factory? also i know the chassis will drop with the smaller wheels so im guessing ill need a cert for ride height? any advice ? Hi Samir- You can change the wheels and tyres without a Cert (within the limits of the WOF requirements), but WOULD need a cert for any sort of spacer or adaptor. You say that the chassis will drop- but haven’t said what tyres you would fit. I can’t understand why you would do this, as a Cert will cost you around $600.00. Wouldn’t it be easier, cheaper, and better to fit some 16’s or 17’s as standard? Hi, I am currently in the process of certifying my r32 gts to a 5 stud and rb30det. I failed on a “no engine check light” issue as I have kept the factory ecu (Im emulating a tune into it as i drive so i can alter it with my laptop ie chip tuning) as i stated to my certifier that the cat over temp light is the light that flashes if the ecu throws an error code, however, it isn’t amber but red. He wasnt sold on this and still sent me away with a failed comment. after digging into the manuals I was able to find a section that says the light acts as a ecu fault light, same as an engine check light aswell as many forums stating the same about r32s and 33s(not sure on r34s). My question is, with supported documents and photos of rear of dash etc will this need to be sent to HQ to prove that that light acts as an ECL. Im very confused and surely my certifier will be able to make a decision on the spot? What happens when you have a r32 come through you? Thanks. I know that the engine check light is a requirement now, and sometimes causes problems. I can only suggest that you talk more to your Certifier, and ask him to involve the LVVTA if neccessary. Hi i have a r34 sedan with factory 25det.however the previous owner put a 26dett in it will this need a cert..
Hi I have recently installed coil-overs / adjustable suspension in my ’06 350Z. Before certification I’m going to need aftermarket rear camber arms and rear toe arms to bring the camber/toe back within legal limit. I’m worried that only certain brands will comply with NZ standards and because I’m buying from overseas I was hoping you could help shed some light on this. Thanks in advance. Hi Zac- there are no “legal limits” for wheel alignment- they just have to make a safe car. Excessive negative camber will be failed, usually at the 1 degree more than manufacturers spec. which happens when lowered too much. Camber and Toe arms- the LVVTA need to approve whatever is fitted now, better you talk to them or to a local LVV Certifier. I have a customer that has a ’74 260z, and I have fitted an XYZ coil over kit, it required weld which was done by a ticketed Marine engineering company, does this need an NDT crack test ?? original struts were factory welded ?? Hey was the deal with driveshalf loops on s14 some say one some say two which is it? They have the hanger in the place and the rear factory loop so should only need one is this right? They need a loop on the FRONT of EACH section of driveshaft- The center hanger bearing does not count as a a driveshaft loop. I am just wondering if you know of any other chassis that share strut tower bars with C35 Laurels? 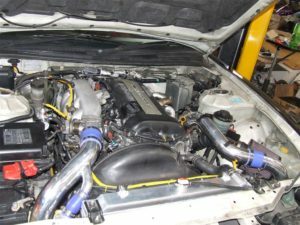 Hey there, I have built a turbocharged s15 from a bare shell. I want a cert, but I’m stuck with a few questions. First off, I have a full set of adjustable arms for front and rear and I have heard that these might not pass cert depending on the brand. How can I tell if my arms will pass cert? Also is it alright to cut a hole in the battery tray for intercooler piping? Cheers. Nice project- nice car. Adjustable arms- I am unable to advise you, as these now are apparently decided at the LVVTA not by the Certifier. Hole in Battery tray- I and other Certifiers allowed this, so long as it was no bigger than necessary, and finished off smoothly. Hi Mitch- Unfortunately I cannot give you a straight answer, as the LVV system is currently under review by the NZTA, changes are happening, plus most of the LVV Certifiers I could have recommended have now pulled out. I have Certed many 180 SX cars modified to SR20DET, and had no problems. Hey john, quick question I have a 96 Nissan laurel 2.8L diesel factory with a rd28 straight 6 and it’s now been changed to a Nissan td27 2.7L 4cyl Diesel engine, mounts are factory td27 with no modification, power difference between engines is 5-10hp, does this require a cert? Your new engine would not be regarded as from the”same family of block and cylinder head”. Where do you get your brakes from and who does the work for it considering that it is likely that there are no brake kits for your particular cars? I want to know for my own quirky car that I would like to upgrade the brakes for. I don’t understand your query- I have never been a car modifier, just a Low Volume Vehicle Certifier up until a couple of years ago. Sorry I can’t help any further. There is no charge for this free advice, but could I ask that you make a small donation to my ‘Give-a Little’ campaign? This is to cover legal costs for defending myself from Defamation charges made by Mr Johnson of the LVVTA. If you did want to, just click though to the Give-a Little page. (iv) Australia on or after 1 January 1986. NOTE 1: The intention of 2.5(1)(c) is to say that if the engine being used in the engine-swapped low volume vehicle originally had catalytic converters, then ‘cats’ must be fitted to the vehicle being engine-swapped. Engines manufactured before the years specified in 2.5(1)(c) were generally not designed to meet any kind of emission standards, or to be operated with ‘cats’, particularly those engines fitted with carburettors. So you WILL need one! At present I think you will need to have a seat-belt anchor point fitted to the tunnel. Go to a seat-belt shop to get this done the approved way. Best of luck with getting it Certified, you shouldn’t have any real issues. There should be no need to custom make or modify a driveshaft. You should be able to source a stock driveshaft to fit, ideally one from the same or higher output vehicle. You should have a good read of the LVV Standard for Engine changes, it has been extensively revised. You may not need driveshaft loops if you fit a driveshaft which matches the engine you are fitting. Hi there, I have a 94 R33 coupe which came with a factory RB25DE Manual, but I swapped the 25DE with a 20DET because I blew it up, with no mods other than some silicone piping and a standard 25DET intercooler mounted under the bonnet with a air scoop attatched above it, is a cert needed for this? no other mods done to the car. I’m thinking about doing the following mods to a 1994 PFL S14 (SR20DET). Which (if any) of the following mods would need a cert? -Aftermarket seats – Read your article on seat belt problem. When you talk about the bracket option, Do you mean an L shaped bracket that connects to anchorage above the seat bracket? -3″ Exhaust – What are the rules on having a decat? Sorry if these have been answered, just want to make sure what I’ve read is correct as there’s a lot of conflicting info. Thanks. What a great project- only wish there had been S14’s and Skylines when I was younger! Installing the Intercooler, the hole by the battery tray will be fine, no structure is affected by that. Just keep it neat. Seats- The LVVTA decided that you need to install a new seatbelt anchorage in the floor. You will need to get this done by a seat-belt installer- it’s not really hard but has to be done just so. Righto, so a cert WILL be needed for all the above mods? Yes a Cert will be needed. Intercooler pipes- usually holes are cut underneath the battery tray, either on one side or both, on these Nissans, the Skyline already has the left hand hole. These should be OK for a Cert. Holes in the Radiator support panel are not good, I hope you have not got holes there. The Cert will also include the suspension, and include the ride height. Camber will have to be within 1/2 degree of spec. You may need to produce evidence about the Truhart suspension components, I don’t know this brand or what parts. What area are you in? I can’t recommend any Certifiers in Auckland, they have all left! Best you ask NZTA now! I guess you have a Laurel or a Cefiro, and have converted it to manual, so need to lose the foot park brake. There is no rule about welding anything, just do a decent job of bolting the lever to the tunnel. I can’t remember if other people have used a reinforcing patch, but not a bad idea anyway. I have a r32 gtr that was imported into the country in 2015, came through compliance fine. Now im being stopped on WOF for braided brake lines, do i need a cert? I was told there was a issue with them being bolt on or something aswell, im not exactly sure. There has been some too-ing and fro-ing on brake pipes, which is why you may hear different stories. g) has an end fitting which is not attached to the hose by means of swaging, machine crimping or a similar process (Note 3). So I have a Nissan Pulsar Gti that has had an SR20VE engine put in, since the engine is very similar tro the original and is still a Nissan, could that pass a WOF? – is of the same configuration. So- if the WOF inspector thinks it is producing more power, he could call for a LVV Cert. Hi Jacob- there is no way I can answer your query- whatever I say, the LVVTA will say is wrong. Best advice I can give is to get in touch with someone who is still a LVV Certifier, and get him to give an opinion. Do overfenders require a cert? Over-fenders do not usually need LVV Certification, as they are not structural. They may have issues with a WOF if they pose an external projections issue, of any issue with visibility of lights. I’m pretty sure I know the answer to this question, just seeking clarification. Will a cert be required with upgrading a rb20e to rb20det? As you are aware everything bolts up to factory mounts etc. You will need a Cert- these Nissan vehicles are never a problem, braking is usually fine, etc. I’m looking at buying a Nissan Silvia s14 prefacelift. If you are fitting a smaller engine than standard, you do not need LVV Certification. Fascitnating no cert needed from a 25de to 20det? In principle none of those mods should be a problem,in that no standards are affected. In practice any inspector would be looking at any dangerous projections etc. Bumper supports are an issue on later “frontal impact” cars, usually the ones with airbags. On a 92, there is no real bumper beam, so it’s just dangerous projections etc. Take care, you have a future (or present) classic, don’t spoil it! I am planning on fitting aftermarket steering knuckles and outer the rod ends to my Toyota 86 from a reputable Japanese brand Parts Shop MAX. I have read somewhere else that these can’t be certed without approval by submitting a 4B form or something like that. Is this true? They can’t just be certed by a certifier? The VIRM (Warrant of Fitness Guide) allows replacement parts that are a direct replacement, and from a reputable manufacturer. No LVV Certification is involved. If these are NOT direct replacement, such as some that are made to give extra steering lock for drifting, then LVV Certification would be required, to make sure that the vehicle is still safe for the road. I cannot tell you how the LVVTA evaluate aftermarket parts, if you do need certification for some reason, you might have to talk to them. First step would be talk to a WOF agent. now my recently purchased r32 skyline is fully certed for an rb25det and other mods such as adjustable suspension, bigger brakes, driveshaft hoops etc done mid last year, but the exhaust certification was not done. A cop has pink stickered my car just for a modified exhaust. Could I put back on the stock exhaust for pink sticker removal, or will I have to get an exhaust certification done for any changes to the exhaust at this point? Also the car has developed an exhaust leak near manifold due to broken exhaust manifold studs. Will WOF process at VTNZ be affected or will this also have to be repaired before going in? The leak can only be fixed by remachining the bolt stud holes by removing the head as there are a few missing studs. Is this a requirement for passing of WOF, or can I temporarily put on exhaust cement around the area affected by the exhaust leak tick? Keep in mind the leak is easily visible when the hood is open and someone leans over to view the hotside. I’m currently hearing a load of different opinions so your professional input will be much appreciated. If a vehicle was being Certified, there is no reason why the Exhaust would have to be included in the LVV Certification- unless there was a question of noise level. If a vehicle is Pink Stickered by the NZ Police for exhaust noise, then it MUST have the LVV Exhaust Certification, regardless of any other circumstances. A Testing station will remove the Pink sticker once that has been done. From my own experience of stripped out exhaust stud holes, these can often be Helicoil repaired IN PLACE, if you can get reasonable access. Exhaust Cement is not likely to stay in place on the head to manifold join, because the studs are needed to hold the manifold secure, without them there will be movement and the cement will drop out. 1 Find a shop / garage that can do Helicoils, of buy the gear yourself, and do a proper repair. 3 They will most likely refer you to a LVV Cerfier in your area who can do the LVV Inspection. Hi John, This has probably been asked before but I want to replace the rb20det from my 89 R32 nissan skyline with a rb20det from a nissan laurel, I believe the skyline currently has hicas but the laurel doesn’t, how can I disable the hicas, is it reasonably easy to do, and does this need LVV certification? The engine change does NOT require LVV Certification- you are just replacing like with like. Hicas can be disabled by fitting a link, which you can buy, in place of the rear steering unit. I am not sure but don’t THINK it needs LVV Certification. Can full HICAS eliminator kits (not just a lock bar, full replacement of tie rods & ball joint etc get certed? I am no longer a LVV Certifier. When I left, the LVVTA were making up rules on an ad-hoc basis, they did not have standards. I cannot see any problem with a HICAS eliminator kit myself. You might try contacting the LVVTA yourself, and see what they say.